The “Baby” of the Desert Eagle family offers an excellent handgun value and plenty of firepower. The grip design is exceptionally comfortable and well liked by shooters. Since 2008 the Baby Desert Eagle was no longer imported into the US, however beginning again in 2011 with the acquisition of Magnum Research by Kahr Arms we are excited to bring this popular firearm back to the US market. Trigger action of the Baby Desert Eagle pistol is double action/single action (DA/SA) and is available in three popular calibers (9mm, .40 S&W, .45 ACP) and several barrel lengths. 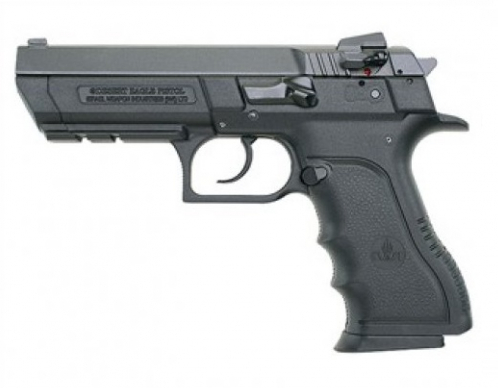 The Baby Desert Eagle pistol is available in either a steel frame or a polymer frame with a black finish. The steel frames and slides are produced from high quality carbon steel with an attractive matte black oxide finish. Full size and semi-compact models feature a tactical rail for optional lasers and/or flashlights. All models come with a slide mounted decocking safety with dual levers and upgraded fixed combat sights with three white dots. The rear sight is well designed in appearance and is snag free.